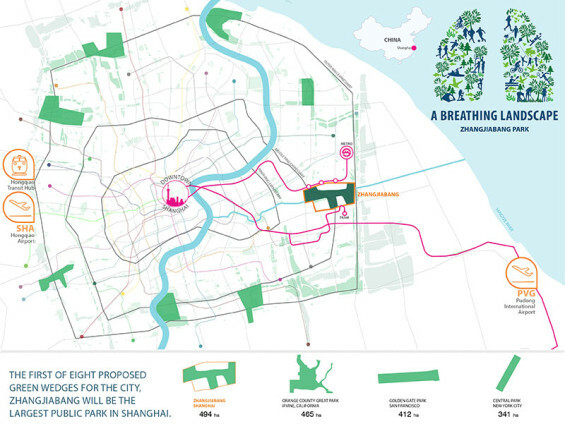 Zhangjiabang is the first of Shanghai’s eight planned “green wedges”, and will become the city’s largest public park. 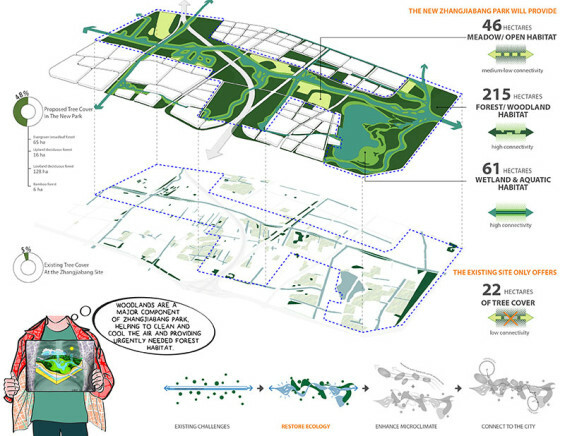 A catalyst for ecological and urban renewal, the park creates an unprecedented amount of wetland and woodland habitat that redefines the natural environment in a city whose residents have increasingly fewer opportunities to experience nature. Shanghai is situated at the delta of the Yangtze River and spreads across a broad alluvial floodplain beside the East China Sea. Its regional ecosystems are transitional between temperate deciduous forests to the north and evergreen broadleaf forests to the south. Historically, the Yangtze floodplain was characterized by open complexes of wetlands dominated by Phragmites and Scirpus marsh communities. Where hills rise above the plain, broadleaf evergreen forests once were dominated by species of Quercus, Castanopsis, Schima, Cyclobalanopsis, and Cinnamomum. The region is critically located at a stopover junction along the East Asian-Australasian Flyway, which is traveled by over 50 million migratory waterbirds per year. China’s long history of human civilization, however, has transformed the region into a complex aqua / agricultural matrix where natural habitats continue to decline. 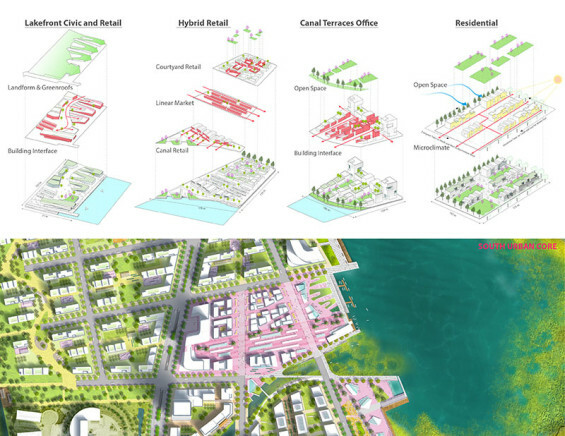 As Shanghai has expanded, urban land cover has replaced much of the rural matrix. Recent decades of industrialization have resulted in environmental conditions so severely degraded that little wildlife remains and biophysical conditions are severe. Tree canopy cover across the Shanghai metro area is only at 10%, while China’s national average for all cities is 25%. A series of recently published biological surveys indicate that species diversity and richness across all studied taxa have precipitously declined. 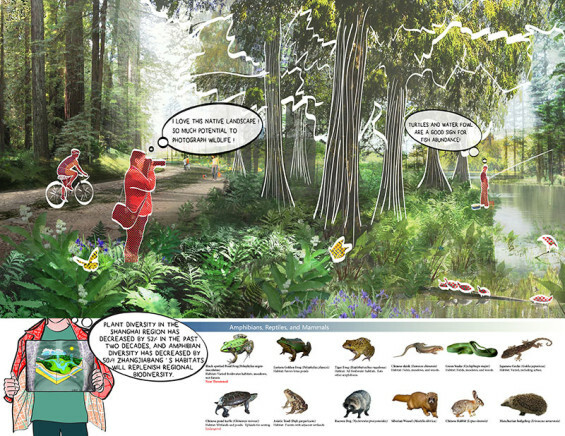 Amphibian diversity in Shanghai has decreased from 14 species to 4. Similarly, total avifauna diversity in the city has decreased 63% from historic surveys. Plant diversity shows even greater declines. 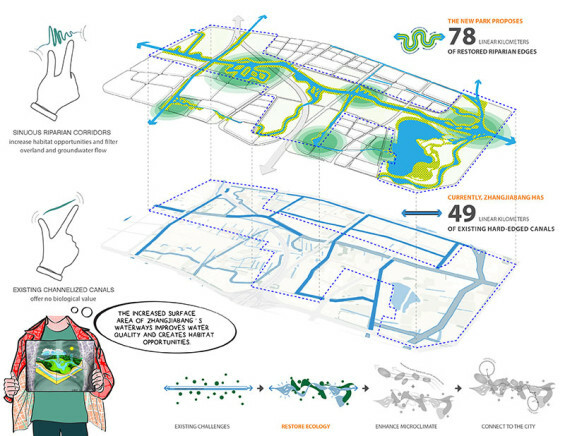 The imperative for landscape restoration in Shanghai is self-evident, and this restoration is the fundamental driver of the design strategy for Zhangjiabang Park. Embedded within 215 hectares of mixed forests, Zhangjiabang Park will include 46 hectares of shallow emergent wetland habitats to serve 113 hectares of open water across the site. 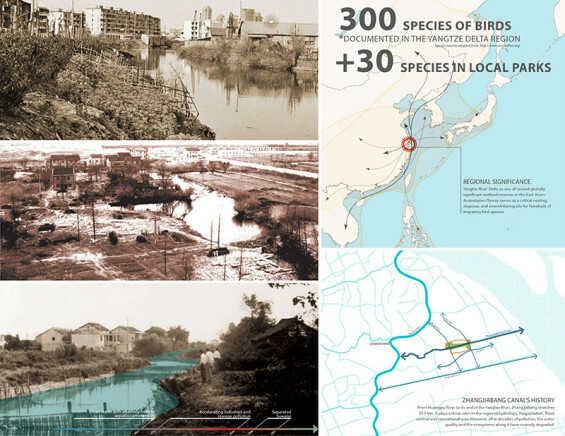 The existing Zhangjiabang Canal and its tributaries require comprehensive ecological restoration to mitigate poor water quality and rebuild the biodiversity of the city’s aquatic ecosystems. This restored aquatic network must also provide flood protection as well as suitable sheltered habitats for wildlife, including the millions of migratory water birds that visit the region each winter. 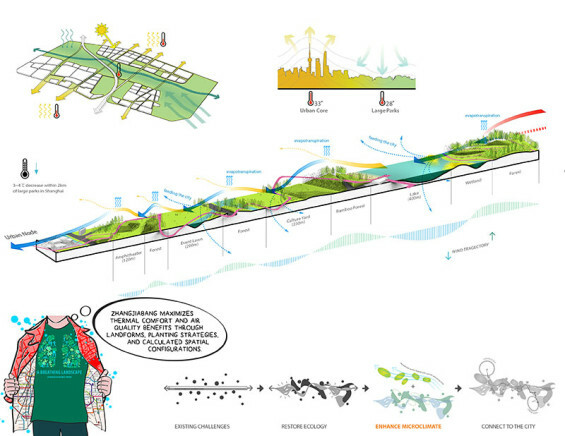 A bold ecological vision was therefore fundamental to the park’s design. This includes the dredging and re-grading of an existing lake into a 31 hectare monomictic lake with maximum depth of 20 meters, a diverse bathymetry, extensive constructed fish habitats, and a nature center / conservation hatchery to support regional aquatic systems restoration. This lake is framed by low forested hills to the east and a dense urban core along its western shore. A large emergent wetland along the eastern shore of the lake is designed as a wading bird sanctuary dominated by Scirpus. Within the forested lowlands are seasonally-flooded vernal pools. Cut and dredge material from across the site is utilized to build up a varied terrain that increases landscape diversity for microhabitats and buffers the site from noise and air pollution from adjacent roadways. Canal edges are redesigned to support generous wetland areas that maximize nutrient removal and reduction of suspended solids. Additionally, community gardens occupy 12 hectares across two major agricultural zones with plots hedged by native flora, providing added complexity to the matrix and enhancing the quality of life for residents in adjacent neighborhoods. 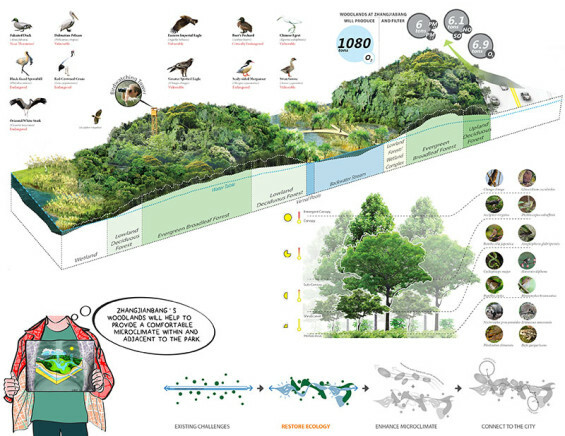 The park’s design intentionally seeks to maximize the opportunities for regional biodiversity to thrive. At least 22 species of IUCN listed birds that overwinter, migrate, or breed in the region will utilize the robust system of wetlands across site which consist primarily of emergent Scirpus marsh, favored by these species. This wetland bird sanctuary is buffered from roads, trails, and active uses but is overlooked by an observation deck with spotting scopes at the top of an adjacent hill. At the lake’s northern shore, a conservation hatchery prioritizes the reintroduction of extirpated aquatic species, including three extirpated frogs, an endangered aquatic turtle, and a broad array of fish species. A comprehensive selection of artificial habitats throughout the park also includes bat nursery boxes, raptor nest platforms, waterfowl nest islands, turtle loafing logs, submerged fish structures, and cavity-nesting bird boxes for barn owls, kestrels, swifts, swallows, and others. Transportation and building infrastructure will utilize wildlife-friendly culverts and underpasses, and decommissioned bridges will serve as both pedestrian and wildlife corridors. 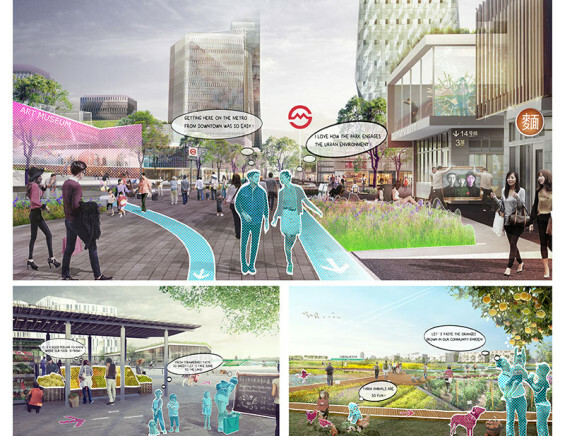 The 4.65 square kilometer park is bounded by an additional 3.75 square kilometers of planned medium density, transit-oriented, mixed-use development. 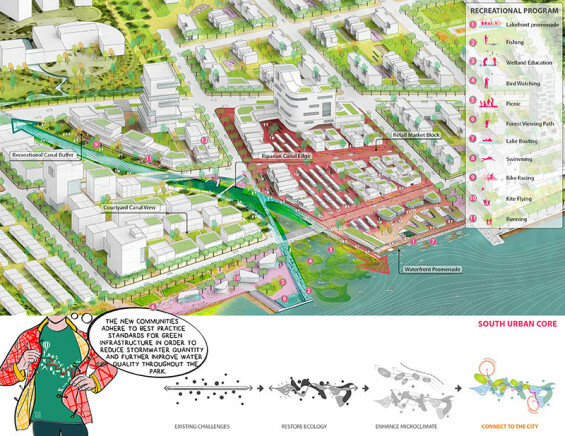 Current conditions consist of degraded and vacant industrial parcels, which are consolidated into a unified public open space anchored by two key mixed-use urban cores. 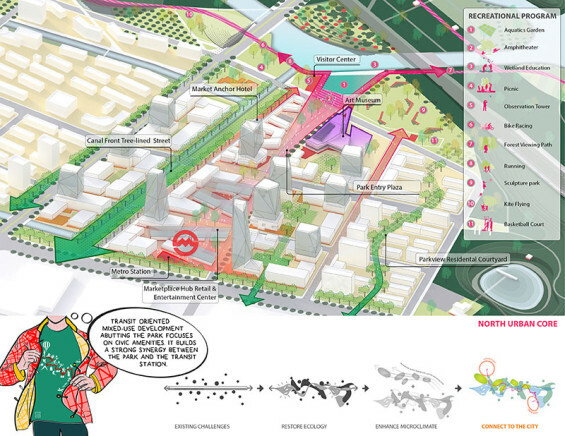 With the recent opening of four metro stations adjacent to the site, Zhangjiabang’s urban program features a diverse, mixed-use typology with a focus on civic amenities that will ensure the park is an integral public amenity energized by public plazas, cultural institutions, open markets, and residential neighborhoods. Zhangjiabang’s recreational program focuses on the interpretive elements of the park’s environmental story, utilizing trails through active and passive recreational zones that provide critical green space access to the city’s under-served population. 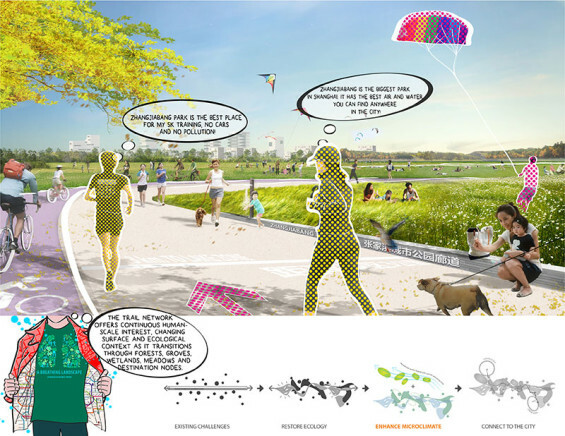 The multiple connective trails offer continuous human-scale interest, changing surfaces, and ecological context as they transition through forests, groves, boardwalk wetlands, meadows, lawns, and destination nodes. The urban spine trail threads through primary event spaces and provides a strong link between the two urban centers on both sides of the park. Throughout the diverse habitats, the 26.5 kilometer trail system provides 18.5 kilometers of universally accessible paths and 8 kilometers of unpaved trails. The urban component of Zhangjiabang adheres to best practice standards for green infrastructure in order to reduce stormwater quantity and further improve water quality throughout the park. Streets are crowned and drained through curb-cuts into stormwater biofiltration systems that buffer the pedestrian experience from adjacent traffic lanes. Under-drained street tree trenches and the extensive use of structural soils beneath sidewalks and bike lanes will maximize street tree health and vigor and further increase subsurface stormwater storage capacity in a generously expanded rooting media. 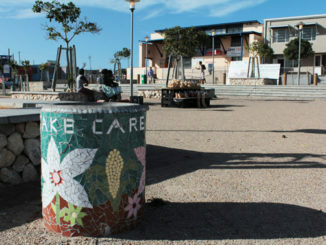 Pedestrian plaza spaces feature dry-laid pervious pavers and open planters. 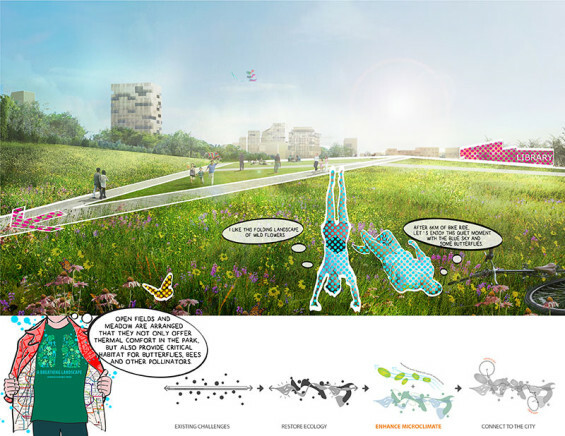 Furthermore, development guidelines strongly advocate for green roofs, cisterns, and other appropriate site-scale techniques for reducing stormwater runoff and encouraging reuse of grey water. The design for Zhangjiabang Park anticipates that Shanghai will continue to grow larger and hotter, and public demand for relief will become more urgent. 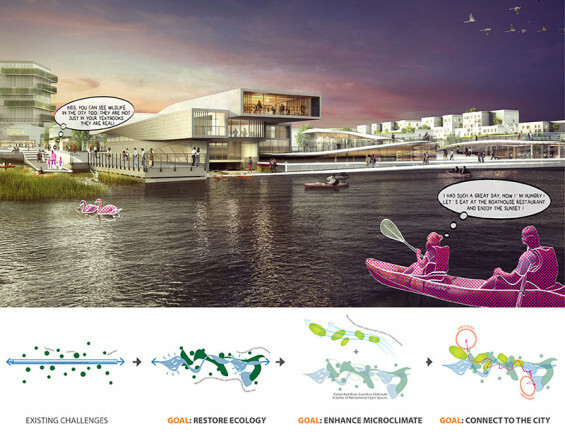 The design process included rigorous climate modeling with the goal of maximizing thermal comfort and air quality benefits through landforms, planting strategies, and intentional spatial configurations. 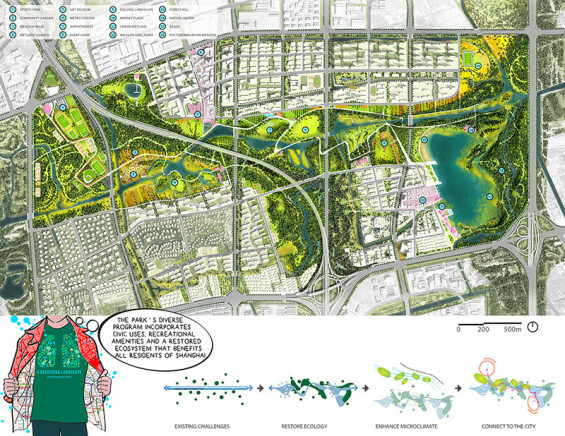 Landscape program and recreational grounds are configured such that alternating forest canopy, waterbodies, and open fields are aligned with prevailing southeast summer winds to enhance passive cooling. 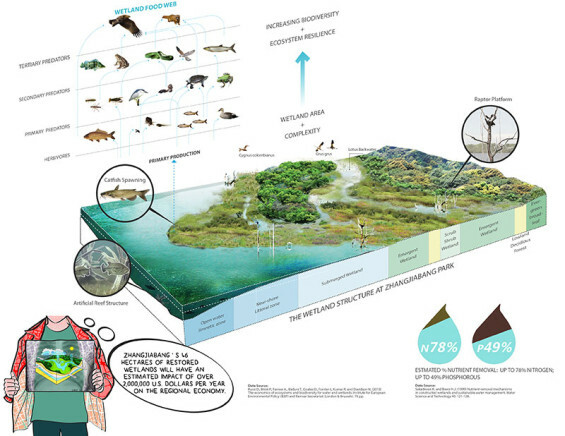 This microclimate design is richly informed by published scientific data employed to quantify the socio-ecological benefits of ecosystem services provided by the master plan. The juxtaposition of cooling forests with open spaces was carefully designed to maximize on-site microclimate benefits and provide four-season choices. An estimated minimum of 100,000 trees will be planted in the park and, among these, the upland species list favors locally-native evergreen broadleaf species to maximize microclimate benefits and provide pollution mitigation. Employing the most credible published valuation, we anticipate pollutant removal by this canopy (at least 19 metric tons annually) is valued at over US $500,000 USD per year (Jim & Chen 2009) and total ecosystem services will exceed US $20 million per year (NYCPRD 2014). Zhangjiabang’s system of wetlands will also provide nutrient removal services valued over US $2 million per year (Russi et al 2013). Existing data suggests that the microclimate of Zhangjiabang Park will be on the order of 3-7 degrees C cooler than temperatures downtown Shanghai, and will provide significant public health benefits. 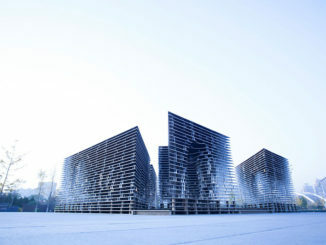 Zhangjiabang’s relatively deep lake will also provide increased heat transfer and evaporative cooling at an upwind position that will decrease downwind temperatures throughout the entire park.